So I wasn’t planning on doing two blogs in a row about fruit, but I noticed a funny sticker on my banana one recent morning when I was making breakfast. You’ve probably seen them around – a small square with a bunch of squiggles, and then four smaller boxes within the image. It’s called a QR code, which a friend of mine dubbed “a bar code on steroids.” They’re getting to be rather ubiquitous, but what do they really do? And this got me to wondering, why would they put one on a banana? So I had to test it out. I have an app called Norton Snap on my Android smart phone that allows me to use the camera to access the embedded information in the code, and then it takes me to the related web site (after first checking that it’s not sending me to a murky domain name where viruses may lurk). It turns out that the banana code takes you to the Chiquita Fan Fun page, where you can register to win a trip to your favorite professional team’s spring training. The third prize is a six month supply of bananas. Both of these were tempting, especially a trip to Florida, but I wasn’t sure I wanted to be added to any mailing lists, so I restrained myself from signing up. Then I noticed one on the tag in the basil plant I bought at the garden center. This one took you to a helpful page with more information about basil, such as the fact that you should plan on one to two plants per person (three to six for winter pesto), and other helpful “secrets to success” when growing basil. Good to know I bought enough for my home cooking needs. A direct mailing from the American Red Cross included one that takes you directly to a page where you can make an appointment to donate blood. A handy tool to respond right away, if you’re so inclined, and one that I would actually use. There also has been one in the newspaper comic strip Rubes, although it was too small to “snap” on my phone. It probably takes you to their web site. I suspect we’ll be seeing plenty of them at the upcoming Xerox Rochester International Jazz Festival, which started posting them on signs and volunteer t-shirts a few years ago to quickly get people to a mobile site with daily festival news, schedules, and other handy information. The jazz festival’s QR code was created in 2010 by the local communications and marketing firm The Philipson Group, which has become known locally for their promotion of mobile communications, especially QR codes. Click here to read more about QR codes. Hmmm … now that I have a smartphone, guess I’m going to have to check out the QR codes this year at the jazz fest, to keep up with the latest news. Or by now, maybe there’s an app for that? This entry was posted in Synchronicity: Musings on Words, Music, and the Arts and tagged app, communications, information, marketing, QR code, Rochester International Jazz Festival, smart phone, The Philipson Group. Bookmark the permalink. 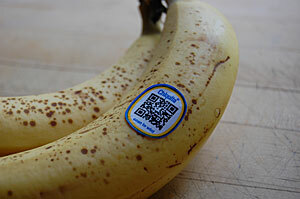 1 Response to Why Is There a QR Code on My Banana? I enjoy reading through aan article that can make people think.